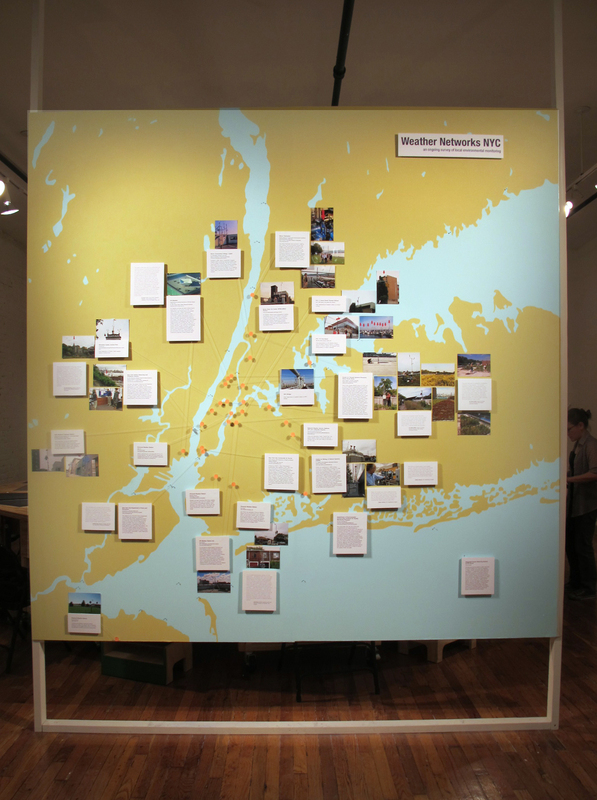 A map with photographs and texts documenting SPWS’s ongoing research into the diverse groups (from government-funded research initiatives to citizen observers) involved with monitoring the weather and environmental conditions of New York City’s ecosystem. Many thanks to the following with their assistance: Dr. Alan Blumberg, The Center for Marine Systems, Stevens Institute of Technology; Dave Conover, Hudson River Sloop Clearwater, Inc.; Dr. Holger M. Eisl, Center for the Biology of Natural Systems (CBNS), Queens College, CUNY; Dr. Stuart Gaffin and Angelica Pasqualini, Center for Climate Systems Research, Earth Institute, Columbia University; Sarah Johnson, NYC Department of Health and Mental Hygiene; Kristen King, NYC Department of Parks & Recreation; Dr. Daniel C. Robie, York College, CUNY; and others. 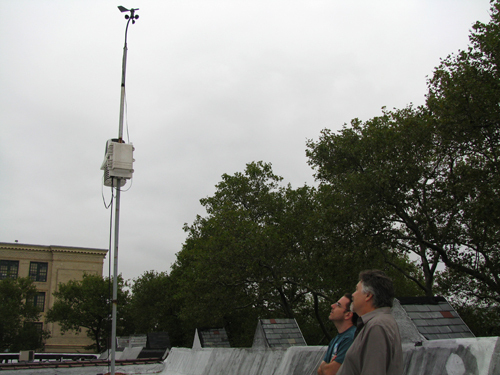 Installed in 2002, Bronx Community College’s Weather Station produces real time weather data for the College Community. The instruments are in the process of being upgraded from a Texas Instruments Station to a Davis Vantage Pro Plus and the college will be installing a Picarro Model Greenhouse Gas monitor as well. Station data in archived on the BCC station’s website. CBNS was established in 1966 by Barry Commoner at Washington University St. Louis and came to Queens College in 1981; it is known for its pioneering studies to devise and assess alternative solutions and its assistance to government agencies and community organizations. 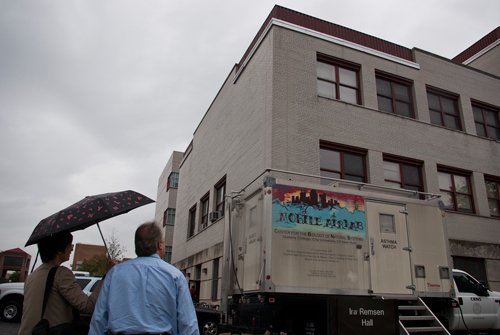 Since moving to Queens, CBNS has focused on urban environmental problems, and increasingly on environmental health. 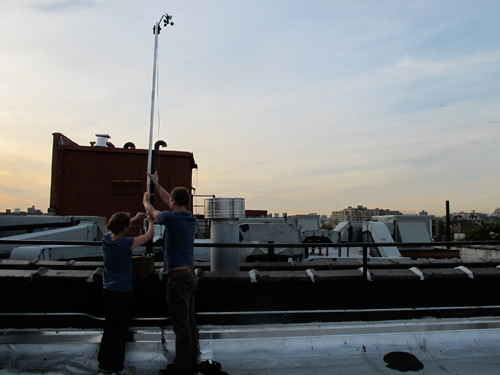 One of its major projects, initiated in response to PlaNYC in partnership with the NYC Department of Health, is NYCCAS (the New York City Community Air Survey), in which CBNS develops and deploys instruments that monitor air pollution on the street level throughout NYC. 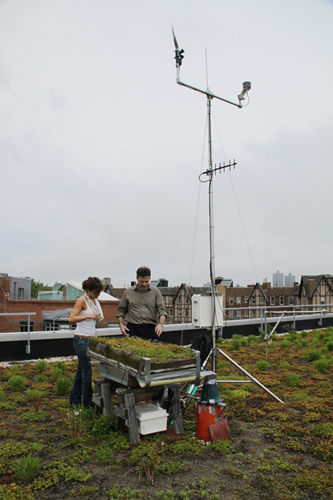 Part of the Climate Impacts group at CCSR, led Dr. Stuart Gaffin and supervised by Dr. Cynthia Rosenzweig at the NASA Goddard Institute for Space Studies, the green roof research project currently monitors about ten green roofs in NYC area and a white roof on MoMA Queens. 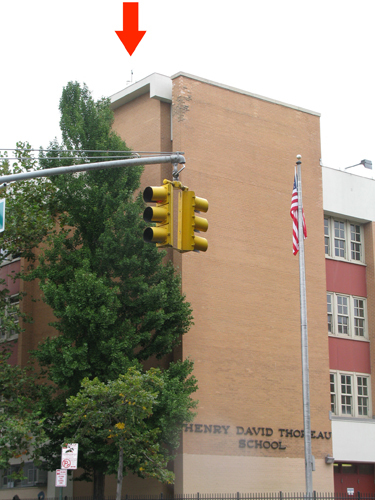 These sites include: the extensive green roof on the ConEd Training Center, Long Island City; a semi-intensive green roof at the Queens Botanical Garden; the Jackie Robinson Recreation Center, Harlem; the Ethical Culture Fieldston School in the Bronx; Regis High School, Manhattan; and Columbia University. Inspired by earlier projects which used National Weather Service and private weather station data to model the urban heat island effect, and supported by owners of individual ‘green’ buildings, Gaffin uses in-situ monitoring equipment to observe the effects of green infrastructure projects on the heat island, through surface energy / water balance, stormwater absorption, and biodiversity impacts. “It’s becoming increasingly evident that urban climate is a very “hot” topic right now and it seems like it’s just going to get more and more important over time. It’s actually a very old science, arguably among the first observations about man-made climate alteration deal with urban climate, from about 1820—it predates global warming theory. As a whole New York has one of the most comprehensive and robust ambient air monitoring programs in the nation. 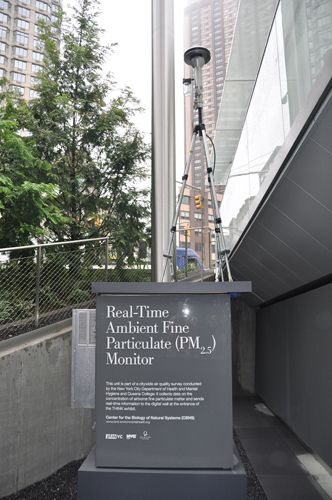 Its network of permanent sites provides continuous air quality monitoring over time, in contrast to NYCCAS, which compare air quality geographically/by neighborhood (by sampling at 15 minute increments, creating a cumulative measurement from many temporary sites). 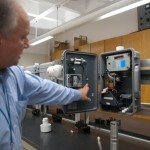 The Queens College DEC site is one of 3 large-scale monitoring sites in NY State, and part of the Environmental Protection Agency’s new NCore Multipollutant Monitoring Network. It is also one of 5 control sites where NYCCAS keeps instruments side-by-side with DEC instruments, in order to monitor the quality of their own data. 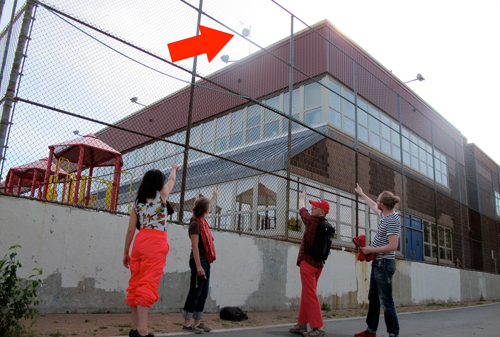 Field observation of personal weather station on roof of non-profit art space for art and technology, installed by artist Andrea Polli as part of the “Hello Weather” project. Hello Weather is a Personal Weather Station which uploads to Anything Weather and CWOP networks. Officially launched by NOAA in 2007, the IOOS Program’s mission is to “lead the integration of ocean, coastal, and Great Lakes observing capabilities, in collaboration with Federal and non-Federal partners, to maximize access to data and generation of information products, inform decision making, and promote economic, environmental, and social benefits to our nation and the world.” The IOOS is a grantmaking program which divides U.S. waters into 11 regions. The New York Bight is part of the Mid-Atlantic Regional Association Coastal Ocean Observing System; IOOS data is used by The Stevens Institute’s The New York Harbor Observing and Prediction System, the Hudson River Environmental Conditions Observing System (HRECOS) and many others. Field observation of NOAA / NWS weather station in Central Park. 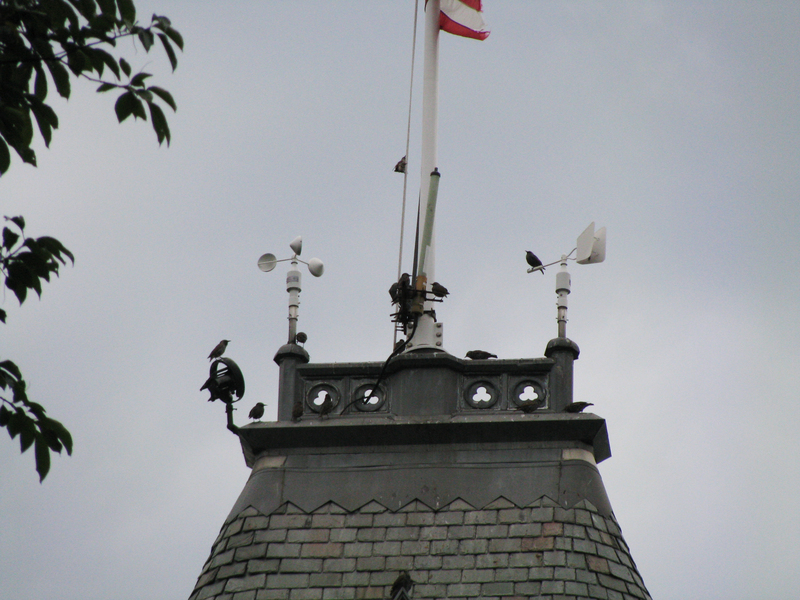 Along with Belvedere Castle, Central Park, the airport weather stations provide the National Weather Service with point data for forecasts in the NYC area. Initiated by PlaNYC, Mayor Bloomberg’s sustainability plan released in 2007, New York City Community Air Survey (NYCCAS) is a collaboration between the Health Department and the Center for the Biology of Natural Systems (CBNS) at Queens College CUNY, which aims to evaluate how air quality differs across New York City. It studies how pollutants from traffic, buildings, and other sources impact air quality in different neighborhoods and monitors pollutants that cause health problems. 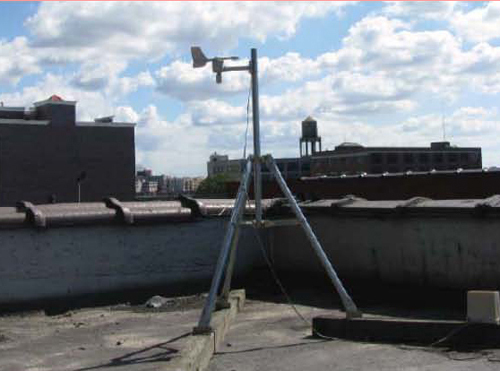 NYCCAS air pollution measurements are taken at about 150 locations throughout New York City in each season. The New York Harbor Observing and Prediction System (NYHOPS), provides real-time assessment of ocean, weather, environmental, and vessel traffic conditions throughout the NY Harbor and NJ Coast regions. Created by the Stevens Institute and based on the Princeton Oceanographic Model developed by Blumberg, NYHOPS incorporates data from over 200 sensors monitoring water conditions in the NY/NJ coastal region. 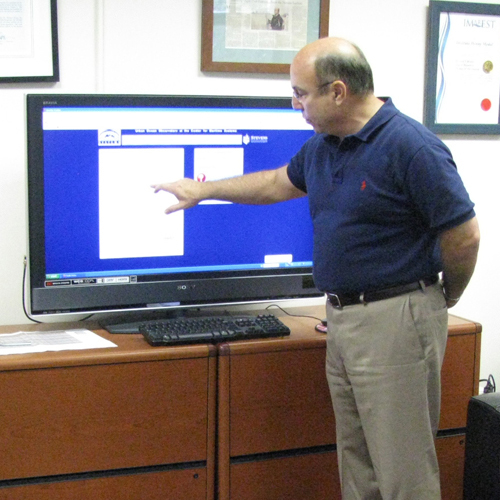 Data & model forecasts are disseminated to the public via the Internet. The research arm of the NYC Parks Department works closely with partners to quantify & measure the urban forest, assessing its impact on human life. While participating in the large-scale NYCCAS Study with the Department of Health and CBNS, they have a multifaceted research program, in partnership with the US Forest Service, the NYC Urban Field Station. The NYCCAS air quality research led directly to a cohort study led by Andrew Rundle at Columbia University, studying the long term impact of trees on human health, specifically in upper Manhattan and the South Bronx. 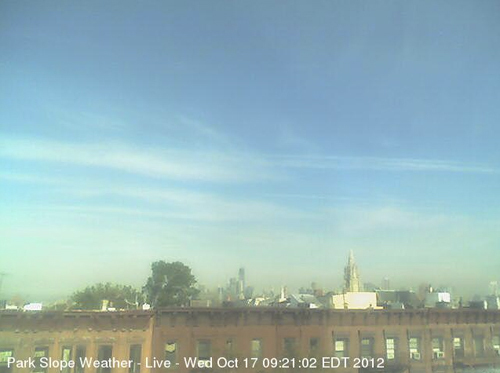 NYCMetNet provides the latest meteorological observations in and around The New York metropolitan area. Observations are updated every 15 minutes to better characterize meteorological conditions within the urban environment. Surface observations consist, in part, of near real-time atmospheric pressure, relative humidity, temperature, wind direction, wind speed, rain rate, and total rain accumulation measurements at building-top sites. Upper air measurements from SODAR and radar wind profilers consist of wind speed and direction at various altitudes in near real-time. NYCMetNet enables various research programs geared toward improving operational surveillance and warning systems for weather prediction and forecasting and helps researchers better understand projected climate change risks. Bradley has been recording Park Slope weather since moving to New York from Seattle in 2005 and posting it on his personal website, which receives in the range of 1200-1400 hits per day. His station has been featured in The New York Times, the Brooklyn Paper, and several local blogs. 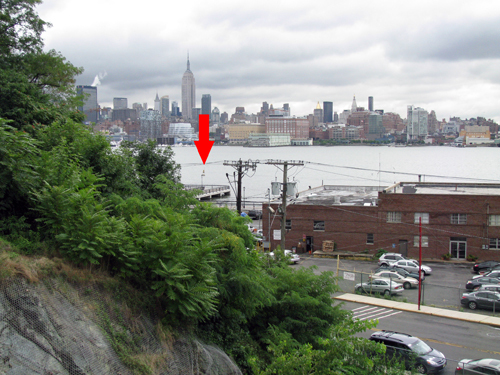 Dan Robie has operated a Personal Weather Station from his current home since January 2005, and has taken weather data in Brooklyn almost continuously for 12 years. He uses a Davis Weather Monitor II Station and uploads data to weather networks, including Weather Underground. He is also Assistant Professor of Chemistry at York College, CUNY. The sloop Clearwater was launched in 1969 by folk musician and environmental activist Pete Seeger, to raise awareness of pollution in the Hudson River. Along with its environmental education, activism and music programs, the Clearwater has served since 2009 as a mobile station for HRECOS, a network of real-time monitoring stations on the Hudson River Estuary. The stations are geographically distributed from Schodack Island to the New York/New Jersey harbor, monitoring river conditions every 15 min. HRECOS is operated by a consortium of many governmental / research partners. Field observations by SP Weather Station and UK-based collective Reactor of weather station on school rooftop and apparent wind anemometers on nearby sailboats. 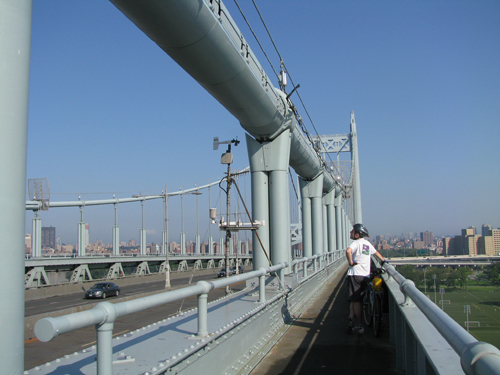 Field observation of weather station on RFK Bridge. Thomas has operated a personal weather station for 4 years. He uploads data via Weather Underground and began taking data to compare his backyard conditions to the surrounding area. 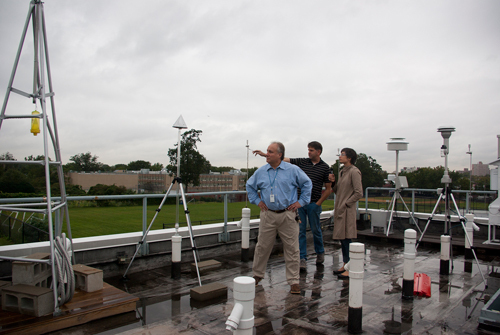 Field observation of weather station on school rooftop. Co-founded by artists Natalie Campbell and Heidi Neilson in 2007, SP Weather Station is an interdisciplinary project that collects weather data, hosts a Guest Lecture Series, and organizes weather-related publications, events, and exhibitions. 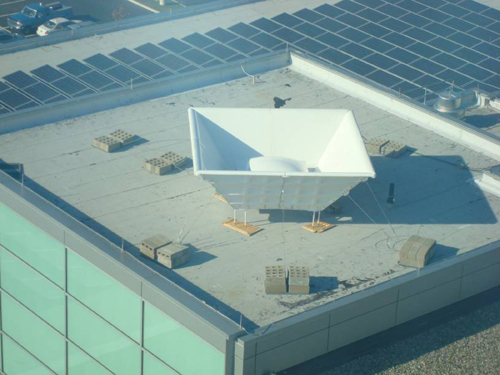 As an informal umbrella organization, SPWS invites participation from many other artists, groups, and weather enthusiasts, while maintaining a rooftop station base in Long Island City, New York. 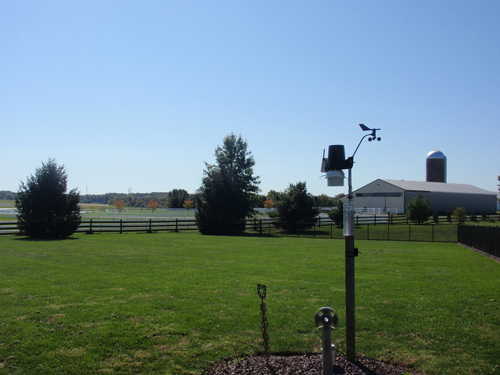 The SPWS uses a LaCrosse WS-2310TWC Personal Weather Station and uploads data to the Weather Underground and PWS Weather networks. SP Weather Station Davis VantagePro2 weather instruments on the roof of BRAC on the Block @ Bronx Art Space, as part of the exhibition “Shifting Communities.” The station monitors indoor and outdoor temperature, humidity, barometric pressure, wind speed/direction, precipitation, and more and forecasts weather for the neighborhood. Data is captured via a LaCrosse WS-2310 at 10 minute intervals. The table and Excel graphs are updated every half hour and uploaded a personal website and Weather Underground.